Taiwan’s President Tsai Ing-wen has reached the halfway mark of her first term in office, with mixed results. At home, Tsai has sought to boost feeble economic growth and prevent the collapse of the public pension system. In the near periphery, Taiwan’s relationship with China has grown increasingly tense; Taiwan’s global presence has been squeezed by Beijing, even as Taipei seeks to strengthen relations with partners in Tokyo and Washington. 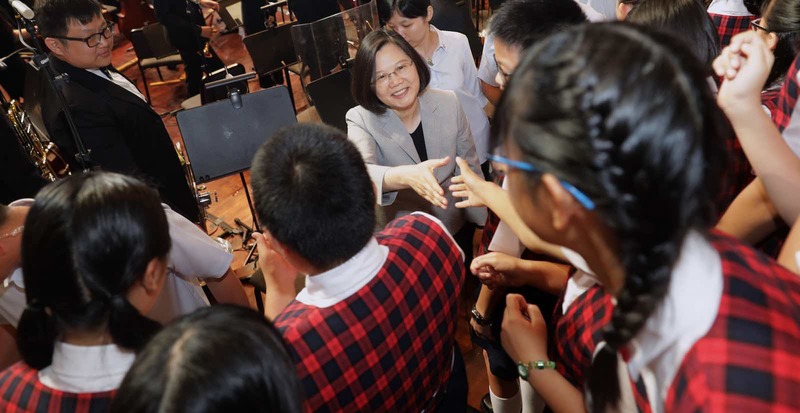 Amid these challenges at home and abroad, how Tsai has fared so far in her term is indicative not only of the challenges that remain, but also, more importantly, what developments await ahead of the November 2018 local elections and 2020 presidential election. When Tsai was elected in 2016, her ascension to the presidency was commonly attributed to a popular discontent with Ma Ying-jeou and the Kuomintang (KMT). Ma couched much of his policy, both domestic and foreign, in terms of Taiwan’s relationship with China. Economic problems, including pension reforms, went unaddressed, and efforts to deepen cross-Strait rapprochement supplanted any urgency in providing for Taiwan’s self-defence. Tsai and the Democratic Progressive Party (DPP) successfully campaigned on a platform that promised to reverse each of these trends and build a more vibrant Taiwan. Tsai pledged to find a new economic way forward, a path that would not entirely decouple the Taiwanese economy from the mainland Chinese supply chain but sought to mitigate the effects of over-reliance by forging new channels of economic cooperation. Her administration implemented the New Southbound Policy (NSP, 新南向政策) that focuses on building Taiwan’s socioeconomic engagement with Southeast Asian countries. But its implementation has been slow. The fruits of Tsai’s NSP have been confined predominantly to the realm of people-to-people exchanges. There is a robust budget to support the NSP – NT$7.26 billion (US$241 million) in 2018 – but how this money pays for flagship innovation, agriculture, and medical cooperation projects, or whether such investment will buoy Taiwan’s economic growth of 2.89%, remains to be seen. Taiwan’s socioeconomic engagement with Southeast Asia is further complicated by the reality that many prospective partners are existing recipients of Chinese economic or development aid. A second prominent domestic policy under Tsai has been the overhaul of the civil service pension system. Without such reform, it was expected that Taiwan’s pension system would go bankrupt. To prevent the collapse of a key societal good, the Legislative Yuan passed a bill that phases out the annual interest on savings, starting in 2021, and raises the retirement eligibility age to 65, starting in 2026. While pension reforms for the military are still a work in progress, it is fair to say that Tsai’s ability to push through pension reform helped stabilise the system, but may have cost her constituent support. Although Tsai’s initiatives have ensured the pension system will remain liquid until at least 2050, the reforms do not address the root of the crisis: Taiwan’s low birth rate. A low birth rate means less working people and more pensioners, systemic problems that will only further exacerbate the challenges of feeble economic growth. Looking across the Strait, the security threat posed by China grows by the day. Chinese leadership, including President Xi Jinping, are vocal about their commitment to preventing “anyone, any organisation, or any political party, at any time or in any form, [from separating] any part of Chinese territory”. This defensive rhetoric has been supported by an increased presence of the People’s Liberation Army (PLA) in the air and waters surrounding Taiwan. Beijing has also stepped up its efforts to marginalise Taiwan in the international community, ensuring that Taiwanese diplomats are squeezed out of international organisations and bilateral relationships. Tsai has personally stated her adamant opposition to Chinese tactics and resolve to ensuring Taiwan’s global engagement. Beijing’s efforts to create a fait accompli for reunification have proven counterproductive, contributing instead to a hardening of the hearts and minds of the Taiwanese populace, and providing impetus for Taiwan to look to partners in Tokyo and Washington. Governing Taiwan is no easy task. Tsai stepped into office having inherited the socioeconomic problems left unresolved by her predecessors. Her approach to managing Taiwan’s relationship with China immediately set the two sides of the Strait at odds with one another. Though it is easy to focus on cross-Strait relations as a central component in assessing Tsai’s leadership or future implications, dynamics in the Taiwan Strait are not the only factor that matters to Taiwanese voters. How the DPP fares in local elections this November will depend increasingly upon how voters perceive Tsai’s domestic policies. Since the only significant opposition party, the KMT, has struggled to redefine itself, discontent with Tsai is likely to feed into votes for alternative “third force” parties or candidates. Looking ahead to the presidential elections in 2020, how the DPP performs later this year will shape whether it nominates Tsai or a new candidate for the election. If Tsai succeeds in strengthening Taiwan’s economy and mitigating the volatilities of cross-Strait relations, she will certainly present her party and the public with a strong case for re-election.